One of my favorite, quick, dirty meals is an omelette. What I found most interesting living in the Mediterranean, was the use of eggs. Sure, an occasional boiled one was found on my breakfast plate. But for the most part, eggs are considered lunch or dinner fare. And even better, was the play of eggs loaded with tomatoes, veggies, seasonings to make that egg-taste disappear. Now, full disclosure here: I used to *hate* eggs. I mean it was up there with cream cheese (yes, I’m weird). I couldn’t get myself near an egg unless it was scrambled with a load of butter and salt. But that was before I learned about menemen! Man this stuff is awesome! It’s quick, light, and loaded with vegetables that take the egg-smell right out of your omelette. It’s super quick, and doesn’t need elaborate changes, so I’ll share with you the recipe right as I learned it: authentic, clean Mediterranean eating. 1/2 cup Halloumi cheese, shredded (if you don’t have -or even know about – halloumi, it is a Cypriot staple. It’s an awesome cheese great for grilling. In the absence of halloumi, use Mozzarella). Toss in the eggs and Halloumi, stirring frequently. The halloumi will melt right in. Remove from heat and add your spices: salt, pepper and paprika to taste. Your meal is done! Here’s another crazy twist: in the Med, if we drink fruit juice, it is ONLY freshly-squeezed (no Tropicana for us). And we drink these freshly-squeezed juices ONLY in the afternoon, never for morning. 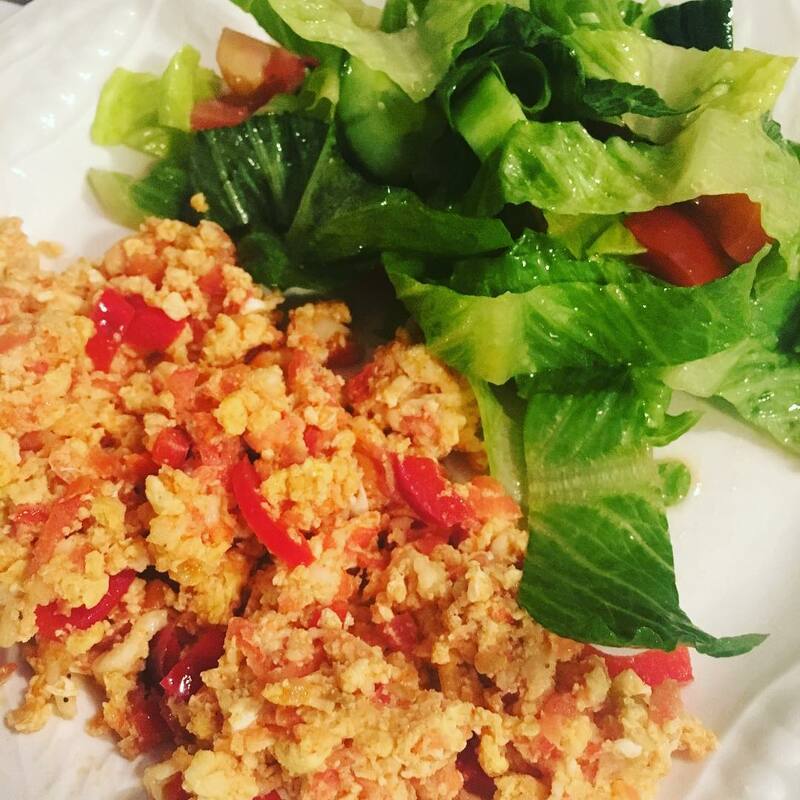 Enjoy your Menemen with a glass of freshly-squeezed OJ and a fresh green salad!